Celebrate the Christmas season with this adorable Puggle Angel Ornament Brown. Our delightful Christmas Tree Ornament measures 2 inches tall and will brighten up your Christmas tree. Not all ornaments are as beautiful and unique as this one and when you hang it on your tree, it is sure to bring joy to all of your loved ones during the holiday season. 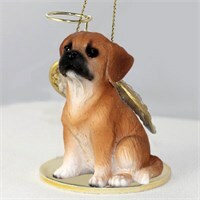 Be prepared for compliments and admiration when you display this beautiful Puggle Angel Ornament Brown. 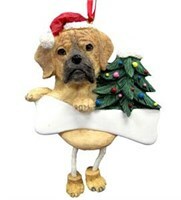 Don't forget about the Puggle enthusiast in your life, this ornament also makes the perfect gift! 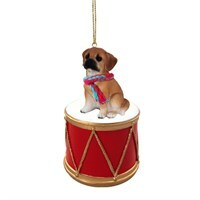 Add a touch of holiday cheer to your decor for years to come with this charming Little Drummer Puggle Brown Christmas Ornament. The perfect stocking stuffer for everyone on your nice list, this adorable Ornament stands approximately 3-3.5 inches tall and is made to last out of durable Stone Resin. 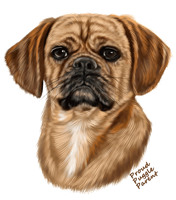 Hand Painted by skilled artisans with a fine eye for detail, friends and family will simply love receiving this Little Drummer Puggle Brown Christmas Ornament as a thoughtful gift from you this hoiday season. The perfect gift for an Puggle Lover. Made in the USA and measures 6" x 4". 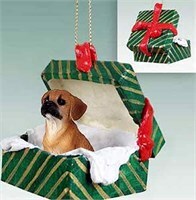 Deck your halls and trim your tree with this sweet and colorful Puggle Gift Box Christmas Ornament Brown. Our Puggle Gift Box Christmas Ornament Browns are crafted from fine quality stone resin and feature a beautiful full color figurine. All of our Christmas ornaments are crafted for a lifetime of memories and make wonderful gifts, and these beautiful Puggle Gift Box Christmas Ornament Brown are no exception. 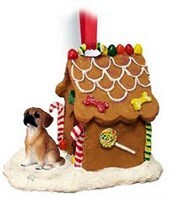 Deck your halls and trim your tree with this sweet and colorful Puggle Gingerbread House Christmas Ornament Brown. Our Puggle Gingerbread House Christmas Ornament Browns are crafted from fine quality stone resin and feature a beautiful full color figurine. All of our Christmas ornaments are crafted for a lifetime of memories and make wonderful gifts, and these beautiful Puggle Gingerbread House Christmas Ornament Brown are no exception. Think outside of the box and create a real sensation with your exceptional Puggle House Flag. This tough Flag is a large 28 x 40 inches with an eye catching double sided image tailor made to withstand any storm. A 2 year no fade or rip guarantee comes with this canine champion that you will be proud to display or give as a cool gift this year. Take the style prize in your neighborhood with the Puggle House Flag right away. This magnificent Puggle Christmas Tree Ornanment will enlighten any Christmas Tree. Our Puggle Ornament has a dog bone name-plate that can be personalized with the name of your beloved Puggle. There's no mistaking which breed is peering out from this darling Puggle Ornament! It's one of those looks that can stop you in your tracks and make you laugh. Gosh, the furry breed is downright adorable, aren't they? This Puggle Ornament captures all of that cuteness and more; the Puggle Ornaments do so by being crafted from premium poly resin and are hand painted. The Christmas Ornaments are perfectly designed to swing on a tree branch and add even more fun to your holiday festivities! Perfectly divine, this darling dog will capture every heart in the room on this delightful Puggle Paw Wipe Towel. Your beautiful hairy companion will astound on this 13 x 18.5 inch machine washable towel finely made from White Terry Cotton. It also comes with a Hook & Grommet for hanging anywhere in your home, car, boat or any place that you bring your best friend. Our Puggle Paw Wipe Towel is an adorable gift idea that friends will be excited to use for several years. 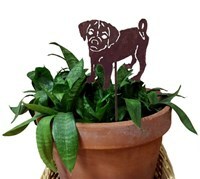 Show your admiration for all Puggle's by displaying our wonderful Puggle Plant Stake. The dimension of the plant stake are approximately 13" x 5.5". These unique Puggle Poses Socks will warm your feet and heart. A comfy blend of 75% acrylic and 25% stretch nylon, everyone will enjoy our Puggle animal socks. Don't be caught in the cold without a pair, they also make a nice gift. 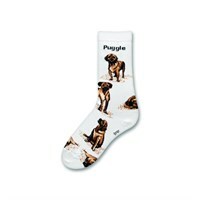 The Puggle socks fit ladies size 9-11. 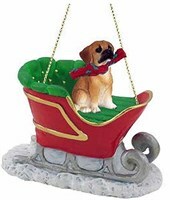 Deck your halls and trim your tree with this sweet and colorful Puggle Sleigh Ride Christmas Ornament Brown. Our Puggle Sleigh Ride Christmas Ornament Browns are crafted from fine quality stone resin and feature a beautiful full color figurine. All of our Christmas ornaments are crafted for a lifetime of memories and make wonderful gifts, and these beautiful Puggle Sleigh Ride Christmas Ornament Brown are no exception. The perfect Shirt for any Puggle Lover. 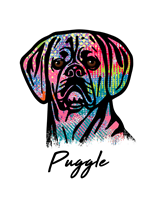 A beautiful Puggle T Shirt for all Puggle Lovers. 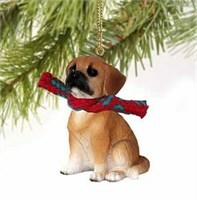 Deck your halls and trim your tree with this sweet and colorful Puggle Tiny One Christmas Ornament Brown. Our Puggle Tiny One Christmas Ornament Browns are crafted from fine quality stone resin and feature a beautiful full color figurine. All of our Christmas ornaments are crafted for a lifetime of memories and make wonderful gifts, and these beautiful Puggle Tiny One Christmas Ornament Brown are no exception. 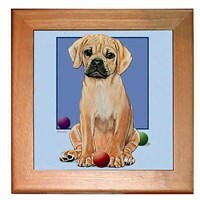 This is one gift that will keep on giving forever with your divine Puggle Trivet. There won't be a long face in the house when you showcase this beautiful 8 x 8 inch Trivet made with Soft Non Slip Cushions and a Pinewood Frame made right here in the USA. 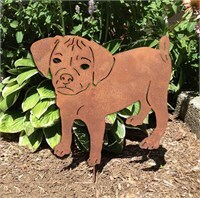 Heat Resistant for use as a Hot Plate, the Puggle Trivet also includes a Pre-Drilled Hole for Hanging. This sweet canine trivet makes the ultimate gift for any fan of this one of a kind breed. 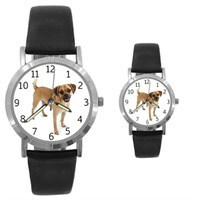 Time after time, you'll hear me say that I'm so lucky to be loving my Puggle Watch. Warm and wonderful, there is nothing like your best friend on this quality made Water Resistant Watch with Stainless Steel Back and Genuine Leather Band featuring a Lifetime Warranty. A perfect fit at 1 5/16" Diameter for Men and 7/8" for Women Your precious Puggle makes an outstanding gift and will tell perfect time every time with Japanese Quartz Movement.